Mmmmm Mmmmm! That's good fats! Coming up on Thursday, August 7 from 6:30pm to 8pm, the South Philly Food Co-op welcomes Certified Health Coach D'Arcy Webb for another installment of our Eat and Learn series. The name of this event is The Skinny on Fats: How Fats Can Be Your Secret Weapon To Eating Healthfully and Feeling Satisfied. As the name of the series suggests, attendees to this ticketed event will most definitely get to eat their ticket price-worth of great treats while also learning how to make them. Tickets are going for the low, low price of $5 for Co-op members and $10 for not-yet members. (So why not also join the Co-op to save the five bucks? You were going to anyway, right?) Click here to go to our TicketLeap page for more info about the event (including location) and to buy your ticket. We'll see you there with our special Chocolate-Avocado Mousse-eatin' spoon! It's possible that you've heard a little bit from us in the last few weeks about 599 and YOU: our spring membership campaign with the goal of reaching (or topping) the 600 member milestone. We've had some super fun and educational events. Another beautiful day brings another beautiful new member-owner household! Welcome Steve and Laura referred by Jean! We've consumed quite a bit of coffee. And now we're in the home stretch and OH. SO. CLOSE. to hitting our goal of 600 members. So we're having a party. And we're feeling so confident that we're just going to go ahead and call it a Victory Party. One Week To Go! Can We Do It? 1) Join the Co-op — and encourage your friends and family to do the same! The only way we can move forward, sign a lease on a location and open our doors is if we increase our membership. Plain and simple. Click here to join our ranks! 2) Buy a T-shirt! 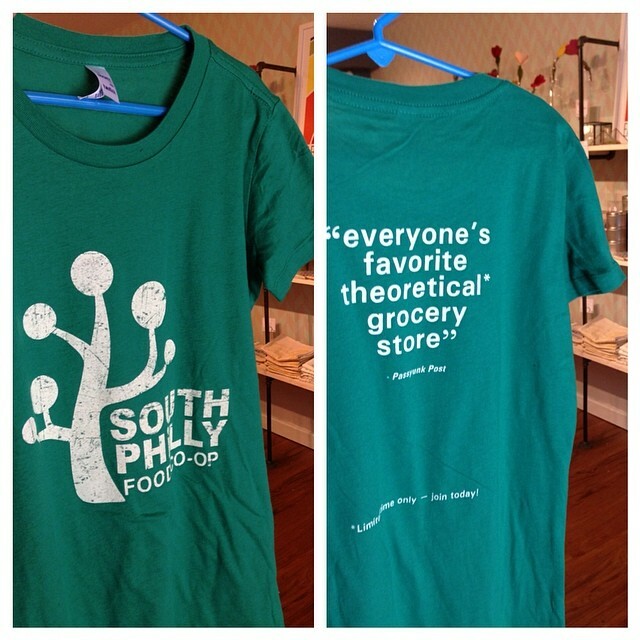 We love our "theoretical grocery store" tees, inspired by our friends at the Passyunk Post. But they won't be around for long! Get yours at a Co-op event, or at the Occasionette on East Passyunk. P.S., kids sizes are available! 3) Visit us at Coffee with the Co-op! We'll be at B2 on East Passyunk on Saturday morning from 9 to 1, talking to folks about #599andyou, selling T-shirts and drinking a ton of coffee. Come say hi! 4) Attend our Victory Party! This is a really important one — we're so close to making our membership goal of 600, but every new person counts! We'll be at Boot & Saddle on Monday, April 28, from 6 to 9 p.m. Come for the camaraderie — and stay for the sweet raffle prizes! Please mark your calendars for our Spring 2014 General Member-Owner Meeting, to be held Thursday, May 22, 6-8 p.m. at PEP Community Room, 1200 S. Broad St. To answer your questions: No, you don't have to be a member to attend, and yes, there will be snacks! Click here for the full agenda, which includes board elections. Hope to see you there! Judging from the Question and Answer session at our Spring General Membership Meeting, the biggest issue on everyone's mind is our location choosing process. Not a big surprise! The Real Estate Committee is now actively seeking and looking at locations and have visited a number of them. Our members understand the importance of keeping a tight lid on information about exactly which locations the Real Estate Committee has seen. Mentioning any specific spot puts us at risk for powering up the rumor mill. Before we know it, dozens of people will think we've found a location and may even join the Co-op because of that spot. That would put us in the very awkward position of having to explain to someone that, in fact, the place they thought we would be opening was just one of many sites considered by the Real Estate Committee. One-way train to disappointmentville! But we do want to be as open as possible about how the Committee is evaluating locations. To that end, we've gotten a copy of the form that Real Estate developed before beginning the site-visitation phase of the process. You can download the form here to get a look at all of the different criteria being considered. This information is the first step. Sites that show promise and merit serious consideration are then passed along for a professional site analysis done which will answer questions about the revenue-generating potential of the location based on characteristics of the building, local demographics, ease of access, proximity to members, etc. We hope this helps give members and not-yet members an idea of how the Real Estate Committee is approaching this monumental task. While they can't reveal locations under consideration, you can always get in touch with them to suggest locations that you may have encountered in your neighborhood. So far the Committee has considered over 15 properties, many of which were suggested by Co-op members! The ideal space is lurking out there somewhere but we (all of us... members, volunteers and committee members) have to find it! Now that you see the criteria used by the committee when visiting a site, you may even be able to provide some info with your suggestion. Questions or suggestions can go to general@southphillyfoodcoop.org. Follow the Co-op's progress by reading the monthly committee reports! It is time once again to share our monthly committee reports with our membership and others who are interested in what we are doing to bring the Co-op to fruition. We have several active committees staffed by dedicated, hard-working volunteers whose one goal is get this Co-op built. As you can see from the reports below, the summer Growing Season has been pretty busy so far and we'll be working hard over the next couple months to accomplish our overall goal of recruiting enough new members to open our store. Statement of Activities & Statement of Financial Position. Records are only updated to 5/24/2013, bookkeeping a bit behind schedule this month. Fair Food account bank reconciliation. This is not yet included with the standard report numbers. Rather than re-work everything now, this issue will be addressed during the upcoming Quickbooks integration. Looking for CPA to handle taxes moving forward, no luck finding one that handles co-op so far. Talked to one who handles cooperatives, but he would like to meet in person in Lancaster, PA. Working to find someone more local. Still awaiting CPA approval of FY13 final numbers, will likely need a new option. Records reconciled as of 6/16. Current active member count is 479 (members in good standing = 425 and equity past-due = 54). Cash on hand = $67,062. (excluding $1,750 transferred to Fair Foods). Non-equity cash = ($1,295) Note- negative due to pending grant-related reimbursement. Business Outreach has received a new SSP application from a local chiropractor office and is processing. BO will be contacting the current SSP businesses for potential garden your sponsors. This will be accomplished by contacting them via email and in person. BO appreciates any assistance from other members, or recommendations on businesses to contact. We did not receive the recent grant from TRF. Grants followed up with TRF for feedback and will report if/when they respond. We were awarded CDC service grant and board will discuss acceptance and $1500 service fee. Pending responses from Clif Family Foundation and PAF applications. Last year's Philadelphia Activities Fund report due June 30, 2013, Events has kindly agreed to submit. We continue to research and update our database. Top on our radar is the Food Coop Initiative seed grant due August 1st for up to $10,000 and requires matching funds. The Leadership Committee does not have anything to report at this time. We are planning to meet soon to discuss long term goals and leadership strategies. The legal committee has been focusing its efforts on getting the member loan committee up and running. Apart from that, the Committee has reviewed and signed off on an agreement with the Community Design Collaborative and coordinated with discussions on site selection and presentations to potential sources of funding. The Marketing and Communications Committee recently completed a design and print project to create 10" x 14" posters featuring quotes from members telling the story about why the Co-op will be good for the community or for their own households. Marketing and Communications intends to contact Business Outreach and Membership to discuss distribution of these posters to local shops and bulletin boards as well as to members who would like to display them in their front windows. The Committee continues to recruit new volunteers to join and help out with the work of spreading the word about the Co-op and increasing awareness among the residents of the community. Marketing and Communications has also been working to brand summer 2013 as "Growing Season" for the Co-op to provide a unified theme for all communications this summer. All committees are encouraged to work the language of growth, gardening, farming, fertility, activity, working etc. and avoid words like vacation, shore, break, lazy, sleepy, etc. when describing the Co-op's activities over the summer. The Committee is also taking up work of overseeing email communications that had been done by the Membership Committee during the 75in75 campaign. Finally, the Committee has begun investigating paid forms of advertising including print ads that would leverage the new posters in publications like Grid. The member loan committee met three times since the last Board meeting, and has made substantial headway in preparing draft recommendations regarding details of the member loan campaign for presentation to the Board. We will present these recommendations at the June Board meeting. The committee has worked to collect and synthesize materials from other member loan campaigns in preparing its recommendations. Josh Richards has met with counsel from three firms to work toward a recommendation of counsel to hire to prepare legal documents in connection with the member loan campaign. The most serious outstanding action item is the hiring of a paid contractor to direct the campaign, which process Anna Shipp has contributed to mightily this month in preparing a draft job description for presentation to the Board. Josh Richards and Alison Fritz also had a lengthy phone call with Leah Pillsbury who led Mariposa’s recent successful capital campaign. The Membership Committee is currently focusing on supporting the CRM (NationBuilder) implementation to ensure appropriate data transfer/capture. We will be working to setting up processes for use of NationBuilder: adding data, searching data, mailing list onboarding/outreach, new member onboarding/welcome, volunteer management, interaction documentation. We will put together a playbook for these items and offer training. Please see the separately submitted proposal for changing the payment plan offering to launch with the NationBuilder site. Committee is working with Bookkeeping to send out equity reminders and may need to postpone this since the switch to NationBuilder is near and may change the process slightly. Committee is in the process of collecting/documenting feedback from the May General Meeting and will begin thinking about venues/dates for the October meeting. Committee is working with P/E to plan a series of “local” potlucks in several different neighborhoods – which will function similar to a house party with an update and call to join but will be open to anyone, members and non-members. Committee is thinking about ways to improve our volunteer onboarding and hope to offer monthly volunteer trainings beginning in the fall. Committee report the success of the Coffee With the Co-op Campaign: 29 new members joined at Coffee With the Co-op events, ~100 new additions to the mailing list from these events. We sent out 265 postcards to our most highly engaged mailing list followers announcing Coffee with the Co-op and distributed 135 postcards through the participating coffee shops. Positive feedback was given for the design of the postcard. Only one person who we sent a postcard to actually joined at one of the Coffee with the Co-op events. We have 30+ mugs remaining for future Coffee with the Co-op events. To avoid some of the scheduling issues we experienced this spring, we recommend scheduling fewer events, spreading out over several months, and not booking 2 events for the same day. Ops continues to oversee outreach to potential lenders. Members of the committee and board have met with representatives from several lenders. So far the response has been positive however our lack of collateral will limit the amount we can borrow. All agencies have said that we should schedule another meeting when we have specific location in mind. Working in tandem with Real Estate Committee, Ops has created site specific pro formas to reflect new information as it becomes available from lenders and potential landlords. Ops has also looked into site analysis vendor referred by TRF, Dakota Worldwide (MN). The committee is securing samples and references on both Dakota and CDS and will make a recommendation to the board as to which vendor the Co-op should contract with. Ops discussed store programming and suggests the following product mix to be used when considering store layout options for a 3,000sqft store: Produce, bulk, dry goods, dairy, frozen, wellness (health and beauty), grab n go (sandwiches, salads), prepackaged meat and fish, baked goods (not made on site), beverages. In process: 1.) business plan (in addition to editing of existing sections we need to write a 5-year vision, marketing plan, and executive summary). 2.) matching “actuals” to “projected” Sources and Uses on pro forma, 3.) Identify potential DCED grants for equipment purchases. Upcoming work includes: 1.) guidelines for electronic documentation storage, 2.) a primer on the Co-op’s sources and uses so committee members understand the basics. Programs and Events hosted two packed, buzzed-about events in June - a pallet gardening workshop at South Philly High School and a Hot Dog Happy Hour at Underdogs, which drew a diverse representation of our membership and signed up new members. The committee is in the thick of recruiting gardens and sponsors for the 3rd Annual South Philadelphia Garden Tour, on Saturday September 7. The participation of all committees and members is encouraged, by connecting the Co-op with potential sponsors and driving word-of-mouth for the event. Please contact Committee Chair Leigh Goldenberg at leighgoldenberg@gmail.com for a complete sponsorship packet. Throughout the summer, Programs and Events will also staff tables at community events and farmers markets. Additional activities are planned for later in the summer to partner with local businesses and to work with members to hosting potlucks and house parties in an effort to keep up the momentum of our growing membership numbers. The real estate committee has been working to identify, visit and vet potential sites for the co-op. We have visited several potential locations. In addition, we are engaging representatives from other local co-ops and contractors as necessary to confirm the viability of potential sites, requiring several visits to potential sites. The Speakers Bureau has presented at a total of 5 events in 2013 and has been helping to coordinate speakers for Co-op House Parties and other events, which are not included in this total. A speaker will be speaking at the Energy Co-op’s Co-op Fair on June 17th. An attempt to recruit new speakers at the General Membership Meeting on May 19, 2013 yielded no new speakers, but we did obtain a few good ideas and contacts for potential speaking engagements. The Speakers Bureau outreach binders will now be updated with the updated talking points. We are actively seeking more speaking opportunities and more speakers. All suggestions and volunteers are welcome. A number of speaking engagements are in the works (4 civic associations; 3 special events; a few house parties). We will also plan to hold a Speakers Training Workshop. Details to follow. From our e-mail bag: When is the Co-op going to open? We've been members of the Co-op now for awhile, but it doesn't seem to be going anywhere. I thought once we reached 400 members that something would happen. Now we're up to 600 members for the goal. Several of us are getting tired of waiting around for a virtual co-op and are unclear what the holdup is. I'm afraid I don't have the time to regularly attend meetings, but I do try to read some of the emails and I'm just not clear on the delay reasons. Thanks for any updates. First, thanks for taking the time to reach out with your questions. We try as hard as we can to keep our members as informed as possible about the overall process for starting the Co-op and the significance of each milestone goal but there are always ways we can improve on delivering that message. We realize that the length of time that it takes to get a co-op operating can be daunting and that it requires a great deal of patience on the part of our members as we go through this process. The member milestones are taken from best practices that successful co-ops all around the U.S. have followed when starting up. As you can see from the timeline for opening that we’ve had in place since we began recruiting members in June of 2011, each milestone corresponds to a specific set of tasks that also need to be done before moving on to the next stage. We try to communicate each time we reach a milestone - first 250, then 400, next is 600 and so on - what the achievement of that milestone allows us to do (i.e. we would not have wanted to start a location search before 400, etc.). From the beginning we've estimated that the Co-op would likely open sometime in early to mid (eta: to late) 2014 and we are so far still on pace for that and not currently experiencing any delays in our original timeline. We’ve been working to educate people that this is necessarily a long process in order to ensure that upon opening the store will be around for a long, long time. The volunteers and member-owners who are making the Co-op happen are working hard every day to move to that next stage where we will have a location picked and begin fitting it out for opening. Our real estate committee has gone on a number of site visits and is narrowing down locations to a few that we will do professional site analyses on to confirm their suitability and viability. We have made the choice not to publicly talk about which locations they are visiting so as to avoid starting the rumor mill that "X" location is where the Co-op will be located. We realize this limits us in what we can communicate to the membership as a whole but the downside of the rumor mill makes it necessary. We simply don't want to be in a position where anyone joins because they think the Co-op will be located in a specific place only to find out later that it was never going to be there. Speaking of membership, our membership committee has continued to push hard since the end of our recently completed, very successful campaign. We continue to have members signing up every week. Our hope is that by the time our Garden Tour fundraiser in September comes around we’ll also be celebrating that 600-member milestone AND the selection of a site that will move us on to pre-construction. Again, thanks for taking the time to get in touch with us and, of course, thank you for being a member. Being a member is the single most important thing you can do to help get the store open. We’re making great progress and will get there soon! Feel free to reach out to us directly with any further questions. P.S. Please share this information with the other people you reference in your email and extend my invitation to them to communicate with us directly if they have any questions.